What to do in Vietnam? 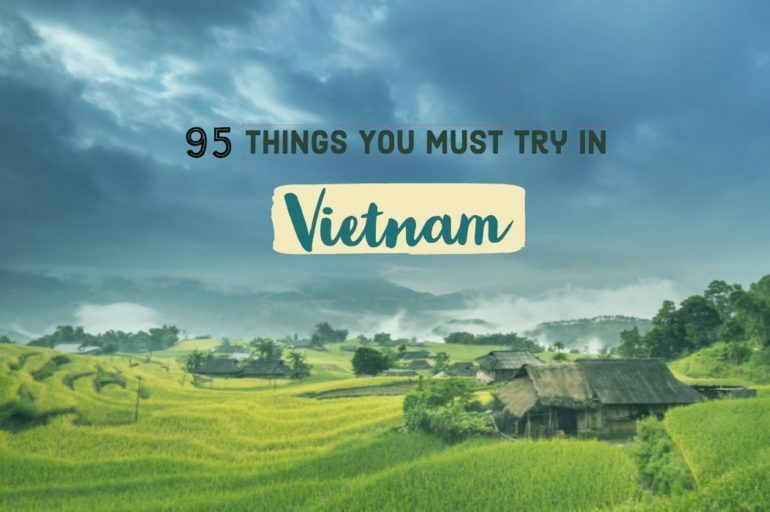 Here Are The 95 Things To Do in Vietnam! Vietnam – The most visited country in SE Asia after Thailand probably. Every backpacker’s haven, foodie’s delight and a nature lover’s paradise. Once you visit Vietnam, you’ll realise that these adjectives that describe Vietnam’s essence are absolutely true. In this post, I’ll let you know what to do in Vietnam – It includes all the things to do in Vietnam. 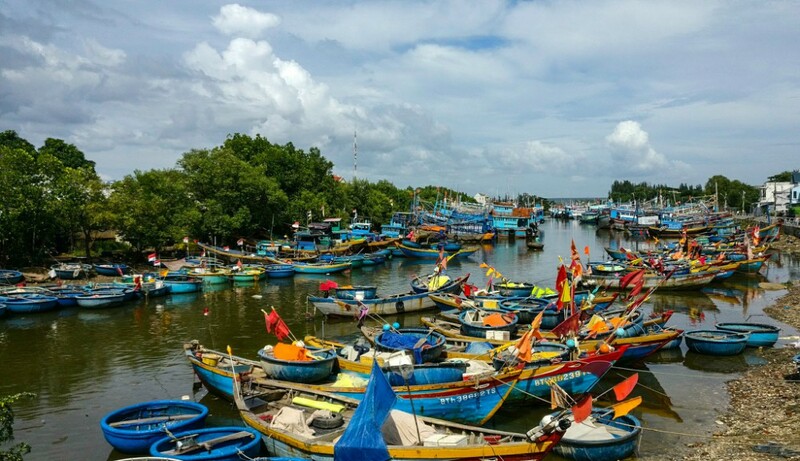 In this post, I have highlighted the summary of all the towns, which in turn will give you an idea of what to do in Vietnam. 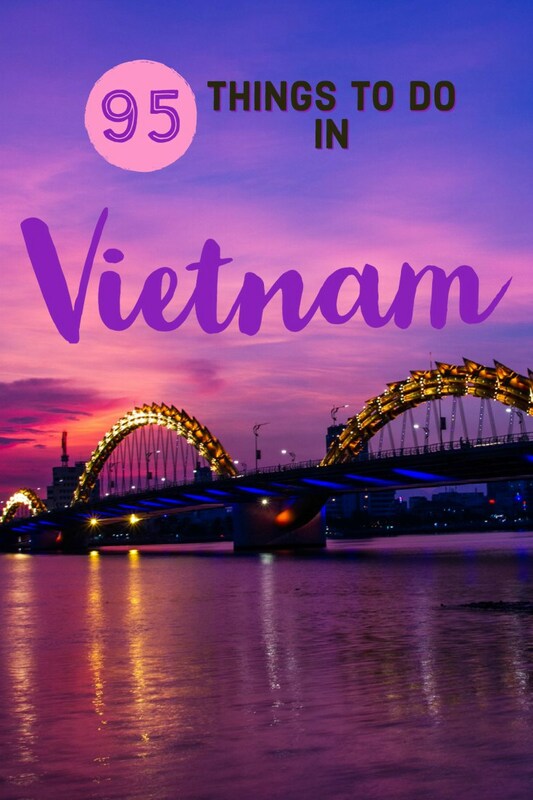 This includes all the fun, adventurous, awesome, fun and cool things to do in Vietnam! I traveled from the south to the north, starting in Saigon and ending in Hanoi. So I have put in the order that you can trace on the map for the places to visit in Vietnam. With much ado, let me take you through the best things to do in Vietnam! One of the top things to do in Vietnam is to visit Ho Chi Minh. Ho Chi Minh or Saigon as it is fondly called by the Vietnamese was my first stop. Depending on what you like, you can base in this city that has great accommodation and food options at very cheap prices. My plan was to stay here only for a few days, but I ended up staying for more than a week! 2. Visit Buu Dien, the heritage post office of Saigon rich in French architecture, which has free Wifi and seating to browse! 3. Party all night at Bui Vien Walking street. It’s also where you can awesome smoothies, local food, and BBQ. 4. Take a tour of the Cu Chi tunnels that were used in the Vietnam war. You can actually come out of one of them! 8. Explore the 18th century’s Notre Dame Cathedral, one of the attractions in Dong Khoi. 10. Get an aerial view of Ho Chi Minh from the Skydeck at Bitexco Financial Tower. Mui Ne is one of the nearest beach towns that you can escape to in South Vietnam. Some people didn’t like Mui Ne, where they said it was too expensive and commercialised. Well, if you ask me, I’d say it is true to some extent. But I stayed in one of the cheapest & best hostels. Plus I saved on food and did my own trips around the town, traveling cheap. So you can do the same too! 16. Take the Hell Ride on ATV in White Sand Dunes – Scary but fun! One of the unique things to do in Vietnam would be to explore Dalat, which is an absolutely delightful place. Dalat became my favourite hill station in Vietnam. Whether it is the cool climate or the chic & upscale neighbourhoods or the vibrant flower gardens everywhere, I just can’t say what all made me fall in love with this city. 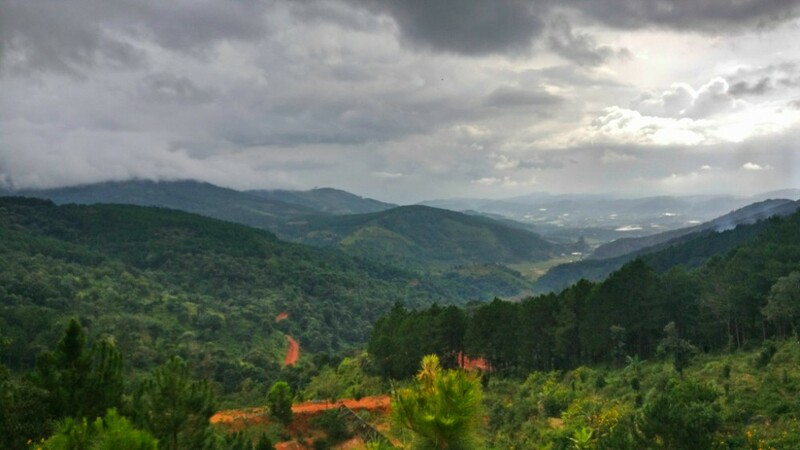 You’ll certainly feel the weather welcoming whether you arrive in Dalat from the north or the south. As much as the city that’s lovely, there are a lot of things to do in and around Dalat. Also, a great place to pick up a bike and drive around! 23. Do Your Own Waterfalls Tour. Check out the list of waterfalls and decide the ones you want to visit (not all are worth visiting – some are overhyped with expensive entry fees) Read the details of all the waterfalls here in my post for you to decide. 24. Whether you visit other waterfalls or not, don’t skip the mighty and majestic Elephant waterfalls. 25. As I said earlier, driving is an enjoyable experience in Dalat, given the mountains and the lush countryside – So go for it! 29. Do your lake tour. There are at least 4 to 5 lakes that are away from the city centre and a few are worthing checking out. 30. If adventure beckons you, head to Bidoup Nui Ba National Park – From half day treks to multiple days treks including camping, you can choose whatever you want along with a guide at the park depending on your time. 31. For a good view of the countryside, visit Lang Bian Mountain. Take a safari or opt for small hikes to reach the summits of a few mountain ranges. 32. Visit the largest sleeping Buddha in Vietnam at Robin Hill at Truc Lam mountain. Hoi An is the gateway to ancient Vietnam’s culture, heritage and the architecture. The old town is unlike any other experience you have in Vietnam, which no wonder turns out to be the favorite town for people, including me. This is also a good town to choose if you want to spend a few extra days to travel slow. Because it is not chaotic, beaches are nearby, and food & bed are cheap & good! 35. 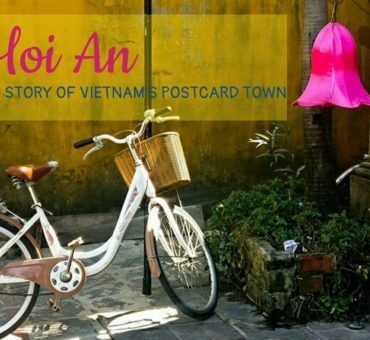 Take a ride on the decorated tricycle within Hoi An’s ancient town and listen to the local cyclists’ tales of the town. 39. Want a beach day? Hit the An Bang Beach which is just a few minutes away from the town. 40. Hire a bicycle & explore the lanes of the old town. Don’t worry if you get lost. You’ll never know what you discover on your way back! 41. If you love photography – whether as a subject or behind the lens, Hoi An has just the right picture-perfect locations. The rustic cafes dotted with vibrant lanterns or the bright yellow & crimson walls – all of them are ideal for your pictures. 42. Rent a bike and check out the ruins of Myson, one of the oldest Hindu temples in Vietnam. The ride is long, amidst the countryside and picturesque, which makes for a great journey! 46. If you are short on time, you can go on a day trip to Danang, which is just 25km away. 47. Don’t come back without buying those quintessential lanterns! (If you are crazy like me, you’ll buy a backpack full of lanterns. But otherwise, you can at least buy a few small ones. Because according to me, that’s one of the best souvenirs that you can get from Vietnam!) Plus, I feel buying them is a way to respect the art and tradition of Hoi An. Do you love history? Or Chinese kingdoms, dragons and red bright walls like the ones that you find in Kung Fu Panda? If your answer is yes, well, you’ll totally love Hue! 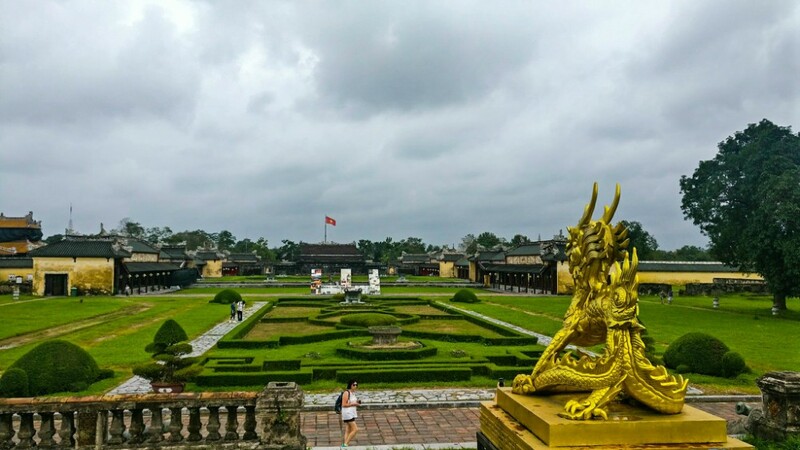 Whether you are here for a day or want to extensively tour around the town, Hue will not bore you at all. 50. First, walk into the former capital city, popularly known as the forbidden city. Make the travel back in time as you explore the monuments in the imperial kingdom. 51. Rent a bike and go on a royal tombs tour. Vist the popular 4 tombs – Khai Dinh, Tu Duc, Minh Mang and Gia Long. 52. If you feel like visiting a pagoda here, head to Thien Mu Pagoda, a 16th-century monument worth checking out. 53. If the history & architecture didn’t satiate your brain cells enough, plan your own little Museum tour. 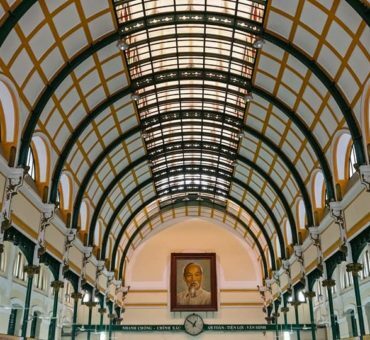 You have the Ho Chi Minh Museum, a War Museum, a Museum of Royal Fine Arts and the Museum of Antiquities, all of which will take easily a day to explore. Danang is that convenient city in Vietnam which gives you the luxury and comforts of a city, hills AND beaches. And the best part is all of them are closely located, meaning which you can plan as you wish! With an airport, Danang is also the popular stop-over place in south-central Vietnam for many travelers. The town is also well connected by road as well as trains, making it a breeze to be here. 54. Be a beach bum – The entire coastal stretch is at your disposal, spoiling you with beaches! The nearest one is My Khe beach. 55. 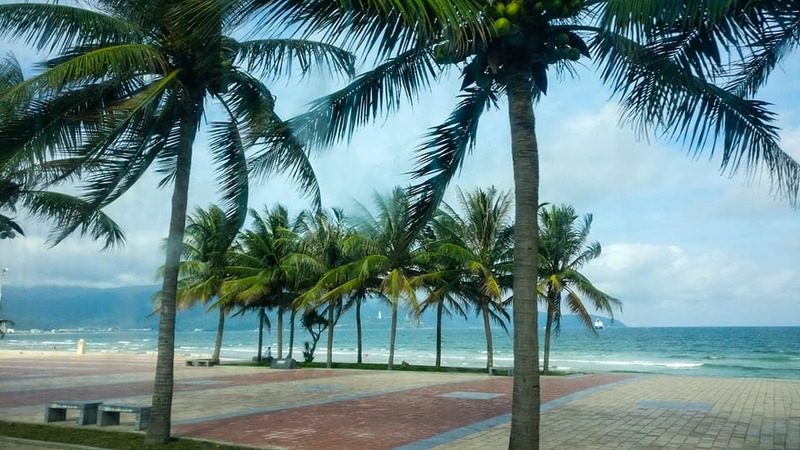 Danang’s is home for the bike adventures – Do them all if you have time! 56. The easiest is the Monkey Pass, more popularly known as Son Tra peninsula. 57. Danang is the place to take up the Hai Van Pass challenge if biking is your thing! 59. Danang is home to three wonderful bridges, which look brilliant during the day & at night when lit up! The Dragon Bridge can’t be missed while you are in the city centre. All the unusual things to do in Vietnam could be done in Phong Nha hands down! If you don’t know already, Vietnam’s is home to the world’s largest cave, So Doong. It is so big that it can fit at least 40 to 50 cities like New York or London and has rivers, forests and many more things yet to be discovered by Humans. Sounds fascinating, isn’t it? Well, Phong Nha in north central Vietnam is the place to head for all the caves. This is also the town to look for your ‘adventurous things to do’ in Vietnam! 62. Check out Phong Nha cave, which involves a boat tour as well. 63. Looking for more adventure? Well, how about Dark Cave? You’ll go on a zip line or swim to reach the mouth of the cave. Then, you’ll do a rappelling, make your way in mud in pitch dark, and kayak or swim your way out. Exciting enough? 64. Doesn’t mind spending money? Then with a little bit of planning, you can visit So Doong, the world’s largest cave. Book the tour which lasts from 4 to 6 days of adventure! 65. Drive around Phong Nha National Park on a bike. The countryside is unspoilt, the greenery is resplendent, and traffic is nill. 66. There are other caves, Hang En and Tu Lan, which requires 4 to 6 days of time. You can do 2/3 days tours too. These tours are fun because you’ll get to camp near or in the caves. 68. Check out my post below to find out how you can independently plan your trip to the caves. I have also added various itineraries for 1 to 4 days so that you plan according to the time you have! Tam Coc or Ninh Binh is the closest place from Hanoi to experience Vietnam’s rich rural essence. 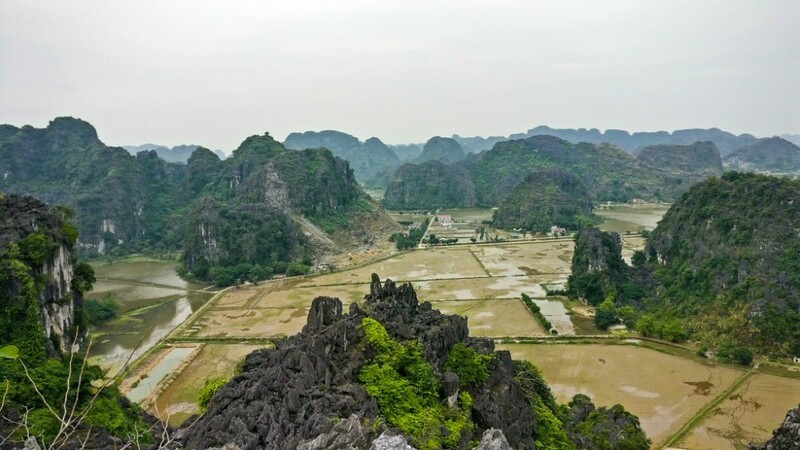 The dramatic hills that continue for so long and the rivers that make their way amidst them, and the caves sandwiched in between – Tam Coc is everything that you can imagine in a countryside that’s flourishing. 69. 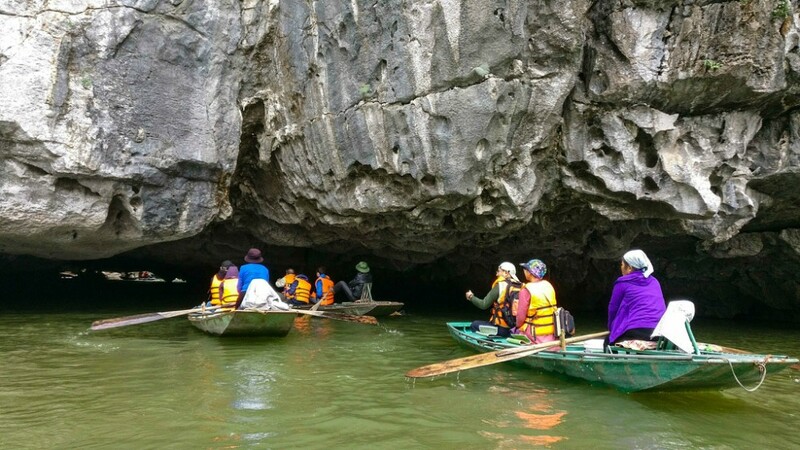 If Phong Nha is for caves, Tam Coc is for boat rides. These are not your regular boat rides. It lasts between 2 to 3 hours, where on a small boat you’ll get up close to the landscape of Ninh Binh. Take either the Trang An or Tam Coc ride. 72. Explore the ancient citadel of Hoa Lu set amidst stunning scenic hills and green paddy fields. 74. Get off the beaten track and head out to look for the grottoes in Lon Vang reserve. 75. If you want to try hiking, plan a trip to the Cuc Phuong National Park, where you can also visit the primates rescue centre. 76. Tam Coc is also a great place for cycling. So if you missed cycling earlier in Vietnam, you should try here! Hanoi is the resilient city that has grown quietly to become one of the coolest cities in Vietnam. I noticed how the capital city is so much different from any big cities like Ho Chi Minh or Danang. 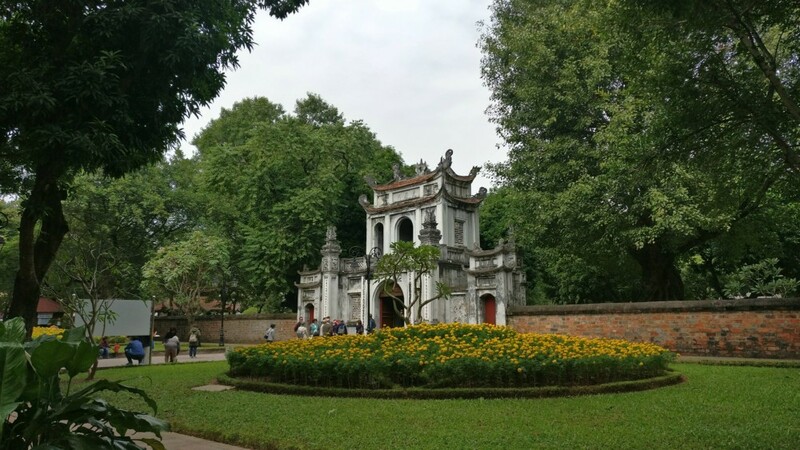 The heritage and the culture of Vietnam coexist with the skyscrapers and well-maintained parks. While the old charm of the city draws you, you can’t help admiring how progressive Hanoi looks. 78. 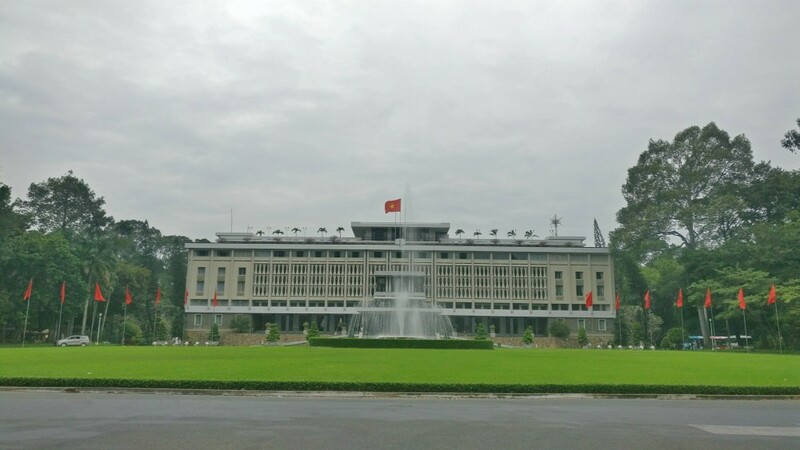 Pay your tribute to Uncle Ho at the Ho Chi Minh Mausoleum, where his remains are laid to rest. 83. Don’t forget to check out the rustic railway track that’s flanked closely by homes. There is also a cafe, so you can have coffee on tracks! 85. Walk on one of the oldest railway tracks built on the Long Bien Bridge across the red river close to the old town. 86. Hanoi is a great city for evening walks around the lakes – Hoan Kiem, West Lake & Truc Bac. 89. Take the day trips to Halong Bay, especially to Cat Ba for a quick island getaway. Apart from these exhaustive things to try & explore in Vietnam, below are the ones that you should try on your trip, wherever you are! 91. Pho – Whether you’ll learn how to pronounce the name of this food or not, make sure you try it in every town. No, Pho doesn’t taste the same in Ho Chi Minh & Hanoi! If you eat meat, even better, because you should try all the types. 92. Coffee – Based on the countries where I have tasted coffee, I have categorised types of coffee into two. Coffee elsewhere and Vietnam’s coffee. Yes, that flavor which melts in your mouth must only be savoured to know what I mean. So go grab the cuppa – both, steaming hot and with ice! 93. 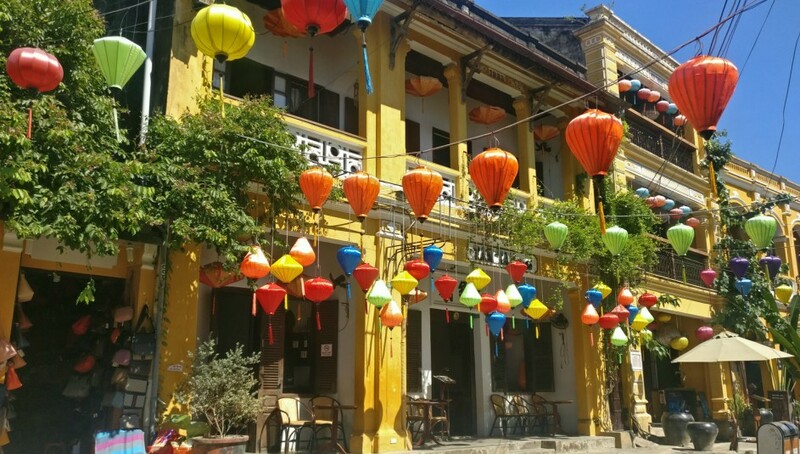 Visit the local markets, buy the Vietnamese hat, vibrant lanterns & explore the country renting a bike/ or as a pillion rider at least in one town! 95. Buses are cheaper and a great way to travel, but I have heard that traveling in trains is a great experience, one of those unique things to do in Vietnam. I couldn’t go on a train somehow. But you can have a look at the schedule to see how you can do train travel in Vietnam. Check the website here.